This is a larger than average semi-detached three bedroomed property located in a sought after area of North Hykeham, just off Station Road. The property does require modernisation, but offers internal accommodation to comprise of Inner Hallway, bay fronted Lounge, Sitting Room, Kitchen Diner, Ground Floor Bathroom and First Floor Landing leading to three Bedrooms. Outside there is a walled garden to the front, to the side there is a gated driveway providing off road parking for numerous vehicles and giving access to the rear. To the rear of the property there is a paved seating area, extensive lawned garden and outbuildings. INNER HALLWAY With uPVC window and door to the front aspect, window to the side aspect, radiator, doors to the Sitting Room and Lounge and stairs rising to the First Floor Landing. SITTING ROOM 17′ 10" x 8′ 11" (5.44m x 2.72m) With uPVC window to the side aspect, electric fire decorative surround and archway to the Kitchen Diner. KITCHEN/DINER 13′ 8" x 16′ 6" (min 8′ 5") (4.17m x 5.03m) With uPVC window to the side aspect, uPVC windows and double doors to the rear garden, door to the Family Bathroom, fitted with a range of base units and drawers with work surfaces over, stainless steel sink unit and drainer with mixer tap above, spaces for a cooker, fridge and washing machine, wall mounted units with complementary tiling below and radiator. BATHROOM 15′ 4" x 5′ 1" (4.67m x 1.55m) With window to the side aspect, suite to comprise of bath, WC and wash hand basin, partly tiled walls and radiator. LOUNGE 15′ 11" x 11′ 5" (4.85m x 3.48m) With uPVC bay window to the front aspect, radiator and electric fire with tiled hearth. FIRST FLOOR LANDING With window to the side aspect and doors leading to three Bedrooms. BEDROOM 1 14′ 6" x 11′ 4" (4.42m x 3.45m) With leaded wooden bay window to the front aspect, radiator, fitted wardrobes, over stairs storage cupboard and access to roof void. 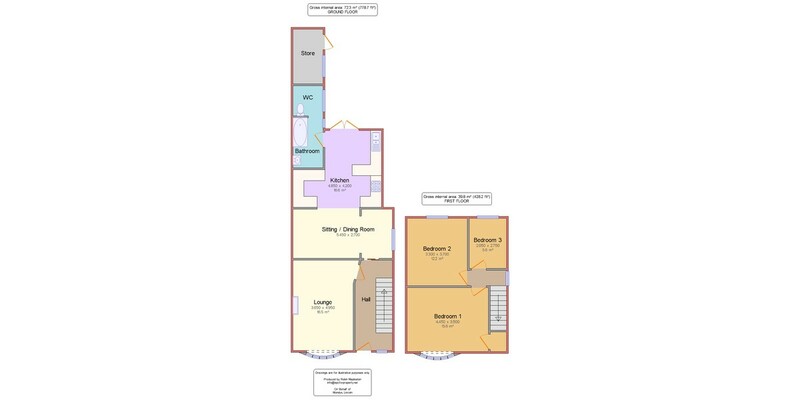 BEDROOM 2 12′ 2" x 9′ 10" (3.71m x 3m) With uPVC window to the rear aspect, radiator and fitted wardrobes. BEDROOM 3 6′ 8" x 9′ 4" (2.03m x 2.84m) With uPVC window to the rear aspect, radiator and wall mounted gas fired combination boiler. OUTSIDE To the front of the property there is a walled garden with decorative woodchip beds and mature shrubs. To the side of the property there is a gated driveway providing off road parking for vehicles and giving access to the rear of the property where there is an extensive lawned garden with outbuildings.